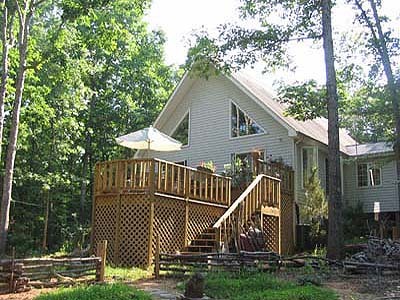 Beautiful, spacious, light-filled three-bedroom, modern house retreat set on five wooded acres 1/4 mile from the world famous Satchidananda "Yogaville" Satchidananda Ashram which was established thirty years ago on the banks of the James River in Buckingham, Virginia (photos). Guests may participate in yoga, meditation, meals, and health spa at the interfaith ashram for extra fees. Or they may design their own retreats with relaxing at the house with home visit massage therapists, yoga instructors, and catering. And/or they can take advantage of any number of local activities: hiking, cycling, canoeing, inner-tubing, antiquing, or enjoying what Charlottesville and Monticello, or Farmville's furniture "Mecca," or Wintergreen's skiing and golfing resort have to offer 50 minutes away. Or all of the above! For questions regarding rental or purchase, write Veronica Adams at veronicafadams@gmail.com, or call 202-340-0488.